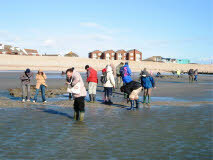 Bracklesham fossil hunts are an exciting activity for both children (generally over 7 yrs) and adults. Weather does not hold us back but the tides can. A low tide is essential. Unfortunately, the best low tides occur fortnightly in the late afternoon or early evening. Trips are not so reliable at other times. Fossil hunt dates can be seen here. For more detailed information on the geology, see the Bracklesham page. We meet in the seafront car park (Pay & Display) at Bracklesham (National Grid Reference SZ 805963) about 1½ to 2 hours hours before low tide. I start with an introductory talk and show some of the more common fossils, as well as giving a simple explanation of the geology. Then on to the beach where I give some tips on how and where to look and we start searching. Fossils get washed up on the beach even if there are no exposures of the fossil beds. Even under the worst conditions, it is usually possible to find a selection of shells and sharks' teeth, 45 million years old. Most people, especially children, are keen to find fossil sharks' teeth and many people will go home with at least one tooth. We head along the beach to reach the fantastic fossil shell beds about 1 km away (just under ¾ mile) at low tide. Unfortunately, conditions on the day may mean that these are buried in beach sand. The whole trip takes around 2 hours, depending on weather and beach conditions. Bognor fossil hunts are also possible, where we search amongst the 50 million year old Bognor Rocks for fossil oysters, shells and the wonderfully named coiled worm tube Rotularia bognoriensis. Please note that I do normally make a nominal charge to cover my expenses.